Irish Film and Movie News » Crazy, Stupid, Love. A middle-aged husband's life changes dramatically when his wife asks him for a divorce. He seeks to rediscover his manhood with the help of a new-found friend Jacob, learning to pick up girls at bars. Robbie's class is studying the Scarlet Letter. This novel is the basis for Emma Stone's previous movie Easy A.
Continuity: After Robbie confesses his love to Jessica in front of a crowd, Jessica pulls him off the scaffold and drags him away for a few steps to speak to him. After Jessica tells Robbie to stop showing his love to her, the next shot does not show the scaffold when Robbie goes back inside the school. Jessica: I'm sorry, I should have knocked first. Robbie: The thing is, I have a picture of you. I think about you while I'm doing it. Crazy, Stupid, Love. is one of, if not the best, American romantic comedies of the past decade. This may come as a shock to some (as it surely took me aback) but there is no other way to describe it. Going into an advanced screening of the film earlier this week, I had my doubts that it would be anything outside of generic. But instead of tripe, I got one of the most unexpected surprises I have seen all year. 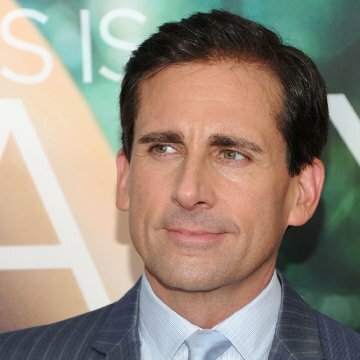 Cal (Steve Carell) and Emily (Julianne Moore) have hit a rough patch in their long-time marriage, and Emily inadvertently announces to an entire restaurant that she wants a divorce. Down and depressed, Cal starts drinking away his sorrows at a local bar, attempting to make sense of his predicament with anyone who will listen. Jacob (Ryan Gosling), a professional bachelor, takes notice and makes it his personal mission to help Cal get over his wife, and become a new man in the process. But this is just the main plot thread of the movie. It also follows Jacob's relationship with the absolutely stunning Hannah (Emma Stone), throws in a bit of curveball with Emily being romanced by David (Kevin Bacon), and even has a bit of a focus on Cal's son Robbie (Jonah Bobo) pining over his older babysitter Jessica (Analeigh Tipton). 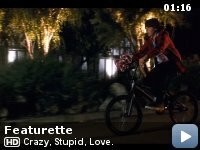 It may sound a little packed with threads and too many characters, but Crazy, Stupid, Love. is able to navigate between each character and couple with ease. It reminded me a lot of Valentine's Day, and how its main goal was to depict how different love is for a sizable amount of couples and singletons. Except it failed miserably at it, and stood out more as an example of every rom-com stereotype you could imagine. Thankfully, Crazy, Stupid, Love. takes the higher road and breathes new life into a stale genre. While the impeccable cast is more than enough reason why the film succeeds so well in being an atypical film in the genre, it is the crew behind-the-scenes that surprises even more. The film is written by Dan Fogelman, who is best known for a string of Disney films and the atrocious Fred Claus, and is directed by Glenn Ficarra and John Requa, who wrote and directed the sadly little seen I Love You Phillip Morris and wrote the now classic Bad Santa. These three would not be the first group on men I would turn to for a film like this, but their relative lack of expertise helps propel the film to the heights it reaches. It takes darkly hilarious turns in certain instances, plays other sequences totally unconventionally, play even more out with a foreboding sense of drama the trailer merely hints at, and trumps more than its share of genre stereotypes. Weaving between the plots lines, they make the film feel unique and different from others, all while giving it an aura of authenticity. While they stumble a bit in the final act with a series of sitcom-like shockers that border on ludicrous, they manage to pull off the rare feat of actually making the audience wonder if these characters will all end up together in the end, or if they will walk their separate ways; something that is truly uncommon for this genre. Acting wise, the film delivers in spades. Carell gives one of his best performances to date as Cal, moving as swiftly as the script requires between depression and humiliation, and touching and hilarious. The film stretches his dramatic muscle more than most, and allows him to give a performance that does not rely on laughs. The expressions on his face are just devastating in some sequences, and the wonder in other scenes is ridiculously hilarious. It is a performance I hope to see him come back to again, and make even better. Gosling plays against type, and gives an absolutely hysterical performance. He shines brightly in every scene, nailing every line and mannerism, while making this scumbag of a lothario become someone to really care about. He exudes chemistry and helps make everyone else's performance better. Moore and Stone also give great performances, easily balancing the humour with the drama. They are not given nearly as much to do as the guys, but hold their own on- screen. The supporting cast does even better. Bobo is phenomenal in his role, conveying an innocence and naivety that is more mature than I thought possible. He acts like more of an adult than some of the older cast does in many instances, and gives the performance a well-rounded other young actors would be incapable of. Tipton is not nearly as good, but plays the role of a confused teenager a little better than you would imagine. Bacon does great in a small turn as does Liza Lapira as Hannah's best friend. But it is Marisa Tomei who steals the show from everyone, playing one of Cal's conquests. She is dementedly unhinged and ridiculously over-the-top, but never falters. Her performance may be one-note, but it is easily the most memorable thing about the film. If I hold anything against the film (other than the final act stumble and the oh-so convenient way one particular scene comes together), it is that it ended. I know I have harped on how unlike other typical romantic comedies Crazy, Stupid, Love. is, but there is really no other way I can rave about it. I easily could have spent more time with these characters, and pined to find out what happened to each of them after the final fade out. The incredibly unlikely pair of Ficarra and Requa has crafted a truly wonderful and hilarious film that is nothing like what you could have expected watching the trailer. It is bittersweet, and easily one of my favourite movies of the summer. And this is coming from someone who loathes almost every single romantic comedy ever conceived.